You train the sales reps and send them forth and the first stumbling block is demonstrations of your product. Certainly the reps do dry runs in training, managers listen in for the first few live demos and then the reps are off on their own and God only knows what happens. 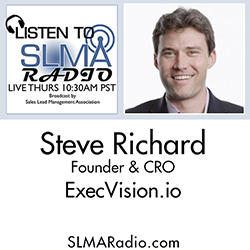 In the program this week Steve Richard, co-Founder and CRO of Exec Vision we discuss the three ways you can be sure to have a great sales demo. The host this week is Jim Obermayer. Steve's mission & life's work is helping sales professionals become wildly successful. Each of the three companies Steve's played a founding role in exemplify this dedication to the betterment of sales organizations.